Looking at this outfit, my immediate thought is watercolouring. So I made a Christmas card using watercolouring technique. 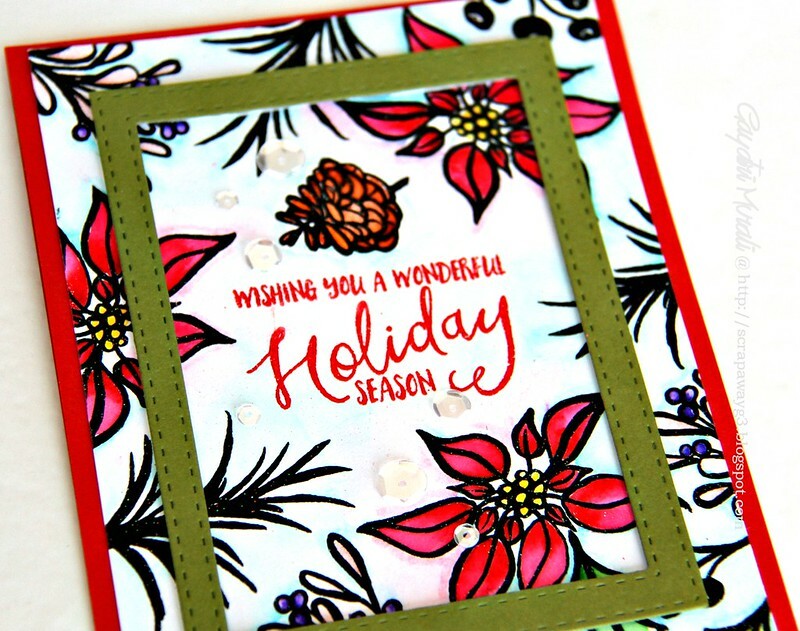 I started with stamping the images from Essentials By Ellen stamp set called Mistletoe and Holly in black and clear embossed the images. The sentiment is also from the stamp set stamped and red heat embossed. I then picked the colours from the challenge outfit and coloured the images and the background. Then trimmed off quart of an inch on the sides to adhered on red card base to give a nice red border edge. To highlight them sentiment, I die cut a green frame using two stitched rectangle die from Simon Says Stamp Stitched Rectangle die set to adhered using foam adhesive for added dimension. finally, embellished with Sparkly Clear sequins from Pretty Pink Posh. Check out Runway Inspired Challenge blog for more inspirations from design team and also the linky to link your projects.